Kitty cats, to the left allow your eyes to take in the loveliness that is J. Crew's Merino Wool-Blend Cardigan; to the right take a gander at Forever 21’s Shawl Sweater Cardigan. Though the fabulous Forever 21 piece lacks the exposed front zipper slantpockets of their haute couture cousin; for a mere $29.90, in comparison to the $135.00 price tag of the ambrosial J. Crew, it provides the same level of chic, cozy comfort at a price that is tailored for the frugalista’s budget! I am strangely drawn to this sweater! I'd get the F21 version. Very cozy looking! I have to go with the Forever 21 jacket,only because they are so simaler! Love the f21 one! You have such a good eye! I think I may have to go for the F21 version because it looks more casual. I am actually going to Forever 21 today so I am hoping I am going to find this or something similar because I love these kind of cardigans so much! Wow! I admire how you find these cheaper alternatives, I wouldn't be able. I'd go for Forever 21. Tis the season to have a variety of sweaters for all sorts of occasions and situations. So HAPPY F21 has this! Great find! I even prefer how the forever 21 model is wearing hers! Happy Sunday! Love the f21! Very affordable! I would also appreciate if you could vote for a good cause? I like the J. Crew sweater. However, they both look great!! F21 - and I love it with that dress..
Oh I love the forever 21 one! It is long and makes a great statement! I am a total J. Crew addict ... am going to have to splurge on this one! Oh, I'm going to have to splurge on this one... You know my passion for J.Crew, my dear! Honestly? Can't tell the diff. Amazing, Erika! love the look of this! i think i'd go for j.crew just because im a sucker for merino wool! oh. easy. forever 21. because it's longer and a lot cheaper. i'd save and get the f21 one, it looks so cozy! great finds - but im in love with the F21 one!! Gorgeous sweater. I like a steal, but unfortunately I cannot pass up a great J. Crew sweater. 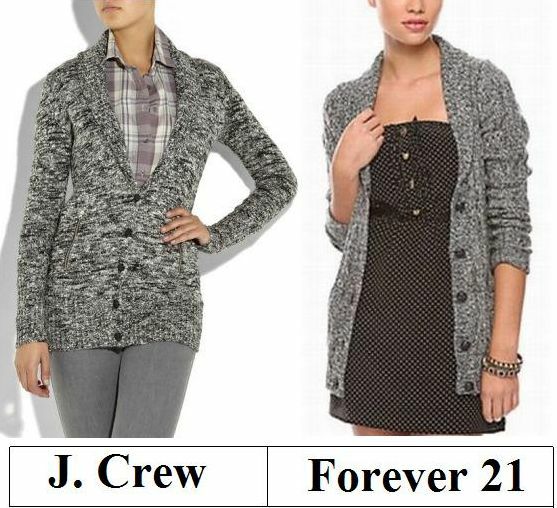 Both of these are nice, but maybe just because of the way it's styled, I prefer the look of the Forever 21. Wow, never thought I'd prefer Forever 21 over something else! Forever 21 really has such great items....nice find again!! Have a great week!! Thank Goodness for Forever 21! Both are totally cute! But in all honesty, I would actually consider shelling out for the J Crew one because I love the ribbing along the bottom. I think it gives a more defined shape than the Forever 21 sweater. Great find, though!! Amazing find! It's so similar to the J. Crew version, you can hardly tell the difference! Great F21 find - it's a chic style at the always lovely F21 price! Oh gosh. I'm so glad that neither option has a little tie belt. The dusters of the late 90s and early 2000s need to stay dead. Love these! They look so comfortable. The Forever21 one is so pretty. Erika I saw the sweater at Target that you were talking about the other day, so cute! I actually bought a gray pullover one from the same collection and think they are great to knock about in. I will say that J Crew cashmere is wonderful and if you can get it on sale it is worth the price! Sometimes cheap is cheap! I would have to feel the difference before I thought about buying the cheaper one! I love them both. So stylish! Cheers to Forever 21 all the way!!! Oh I love both of these! I think I would go for the F21 item, since they look so similar.